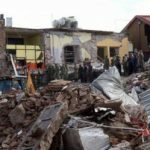 Some of these disasters, like Friday’s earthquake in Mexico, are natural. Others may end up having a mix of natural and man-made ingredients after scientists examine them. We also always tend to look for patterns and order in chaos, even when they aren’t there, psychologists say. Hurricane Harvey hadn’t even fizzled and Houston hadn’t even dried out from record flooding before Hurricane Irma formed and also grew into a powerful Category 4 storm. Right behind Irma, Jose has powered up to a Category 4 storm. It is highly unusual, but not unprecedented to have back-to-back storms of that strength, Masters said. And then there is Hurricane Katia, just a shade under major hurricane status, due to hit Mexico’s Gulf coast. The last couple of years were quiet for Atlantic hurricanes, which makes this year seem even worse, said Colorado State University meteorology professor Phil Klotzbach, a hurricane expert. He said calculations that measure strength and duration show the three current Atlantic storms set a one-day record for energy on Friday. In just three days, Irma, Jose and Katia have produced as much as energy as about half a normal six-month hurricane season. As Mexico was bracing for Katia off the Gulf coast, one of the strongest earthquakes in the country’s history hit late Thursday off its Pacific coast, near the Guatemala border. The magnitude 8.1 earthquake was felt for more than 650 miles (1,000 kilometers). The quake shook at a depth of 43 miles (69 kilometers) and a quake hitting at that depth with that strength is unusual, according to Cornell University geophysics professor Geoff Abers. It was one of the five largest for that deep in the past 40 years, he said. On Friday, 82 wildfires were burning in the United States involving nearly 1.5 million acres in nine states in the West. So far this year, more than 8 million acres have burned, only behind 2015 and 2012. One fire at the Rogue River-Siskiyou National Forest in Oregon has burned more than 175,000 acres and is only 5 percent contained as of Friday, according to the National Interagency Fire Center. Drought and a heat wave contributed. On Sept. 1, in normally temperate San Francisco, the temperature hit 106 degrees and at least six deaths were reported from the heat wave. It can take weeks or months for scientists to determine whether an extreme weather event was worsened by man-made climate change. But scientists have long predicted that the strongest hurricanes will get stronger and wetter, fueled by warmer ocean water. And some say the recent global increase in powerful hurricanes fits perfectly with global warming. While warming may play a small role, so does Twitter and Facebook in making things appear worse, said Klotzbach. Researcher Monika Mathur contributed to this report. Mayweather vs McGregor: What did we learn from the weigh-in?